In December of 2015, Greg Conner of WoodsRun Consulting Forestry and ACF member, and Forest2Market's Joe Clark collaborated on a blog post on the value of a consulting forester. Recently, Joe analyzed newer full-year data to see if the 2015 conclusions—that timber sales involving a consulting forester offer added value to landowners and that, in most cases, "consultant sales outperform non-consultant sales by a significant margin"—held true in 2016 and 2017. The primary goal of this analysis was to distinguish the effect forestry consultants have on the outcome of timber sales (price paid for stumpage). Because of the numerous dynamics that affect stumpage pricing, all factors (or as many as possible) were held constant to properly assess the impact consultants had on a sale. To accomplish this, sales were first separated into two categories: pay-as-cut (per-unit sales) and lump sum sales. The data was then analyzed by each sale type. Once sales were broken out into their proper segments, the effects that each sale/tract attribute had on overall sales were analyzed. Sales that included a consultant and sales that did not involve a consultant were then compared. 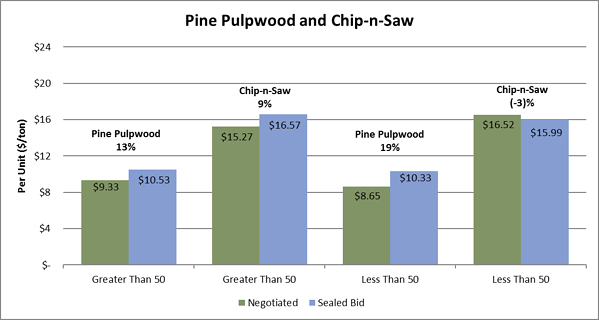 Figure 1 illustrates a southwide average of per-unit prices for pine pulpwood and chip-n-saw, comparing negotiated vs. sealed bid per-unit sales. The data in this graph consist only of per-unit sales, with timber type being held constant at “plantation” and harvest type being held constant at “row thin;” both tract areas (less than 50 acres and greater than 50 acres) are also examined. Sealed bid sales, as stated by timber buyers in previous studies, typically bring higher per-unit prices across all products as well as both tract sizes. 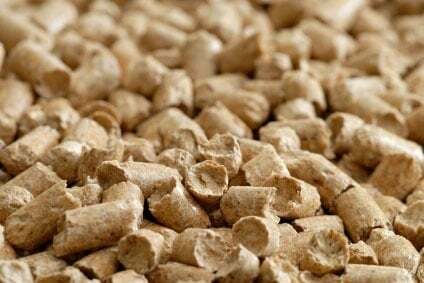 For tracts greater than 50 acres, sealed bids brought 13% higher prices for pine pulpwood and 9% higher prices for chip-n-saw. On tracts with fewer than 50 acres, pine pulpwood prices were 19% higher. Chip-n-saw on tracts with fewer than 50 acres is the only product where negotiated sales brought higher prices than sealed bid per-unit sales, 3% higher. 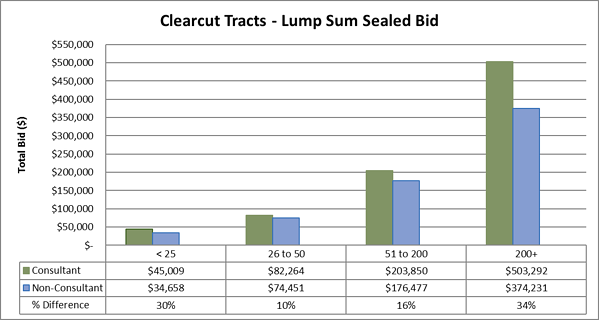 Figure 1: Comparison of per-unit sales (Negotiated and Sealed Bids) on tracts that are both less than and greater than 50 acres. Figure 2 highlights consultant vs. non-consultant lump sum sales, and this graph does not hold any variable constant that might otherwise impact total bid; the only constant included is the involvement of a consultant with the sale. The data illustrates a consistent pattern of higher total bid sales when a consultant is involved. It is also important to note the yearly fluctuations; 2012 demonstrates a 30% increase in consultant sales over non-consultant sales, while 2014 appears to be an anomaly. However, the data show that average sales that included a consultant from 2010-2017 brought a total bid that was 17% higher. Figure 2: Comparison of consultant vs non-consultant sales consisting of lump sum sales (Sealed Bids), 2010-2017. Average total bid for both consultant and non-consultant sales. Figure 3 presents a more defined look at product allocation, as it shows consultant vs. non-consultant sales where pine sawtimber makes up 26%-75% of the volume of the sale, as well as all the other factors examined before this. In both cases, the same pattern illustrated in previous charts reveals itself yet again: sales involving consultants consistently bring higher total bids when compared to sales that do not involve consultants. 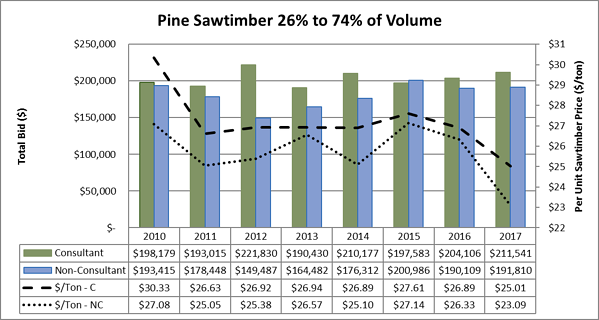 When product allocation is defined (sawtimber being 26-75% of volume), the average increase in total bid was 13%, while the per-unit sawtimber price on these consultant sales was 6% higher on average. Not only are the total bids higher, but the per-unit price for sawtimber on consultant sales is also consistently higher as well. Figure 3: Average total bid for both consultant and non-consultant sales. C = consultant sales; NC = Non-consultant sales. Figure 4 illustrates that consultants improve the total bids that landowners receive across the spectrum of acreage. Whether it is a very small tract that is less than 25 acres or a large contiguous tract of 200+ acres, consultants consistently bring a higher total bid. This data set shows that consultants bring a very high value to small (<25 acre) and large (200+) tract sales, raising the total average 30% and 34% respectively over bids with no consultant involvement. Consultants have success in the other two acreage categories as well, bringing in 10% more for tracts that are 26 to 50 acres and 16% more for tracts that are 51 to 200 acres. Figure 4: Comparison of consultant vs. non-consultant sales consisting of lump sum sales (Sealed Bids) that were clearcut and timber quality described as “good,” 2010-2017. Acreage has been categorized as less than25 acres, 26-50 acres, 51-200 acres and 200+ acres. Average total bid for both consultant and non-consultant sales. The original blog post from 2015 proved that timber sales involving a consulting forester—whether it was a per-unit or lump sum sale—brought higher value to the landowner. The updated analysis using 2016-2017 data also confirm this trend over time. On per-unit sales (sealed bids in particular), sales that involved consultants exceeded the non-consultant sale prices by no less than 11%. 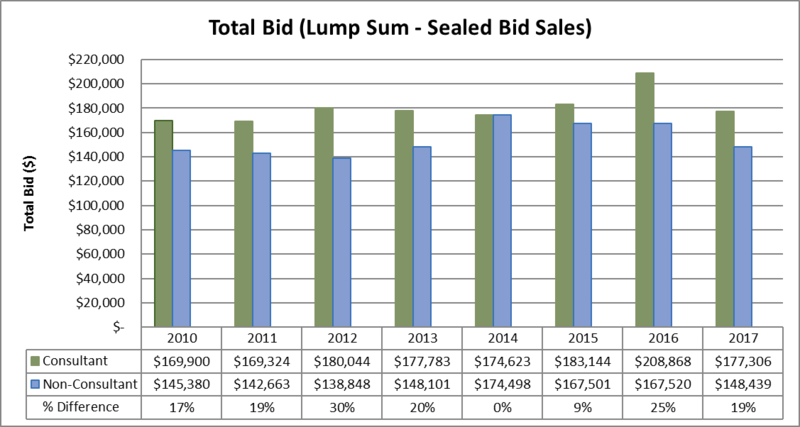 The data also showed that consultants did equally well on lump sum sales, bringing an average increase of 12% on total bids. Not only did the trend hold over time, but it also held over various tract sizes, with consultant sales bringing higher total bids on all four separate acreage categories.